12 More HarborLAB Volunteers are Red Cross Certified! Heel of the hand on the breastbone and pumping at 100 beats per minute. 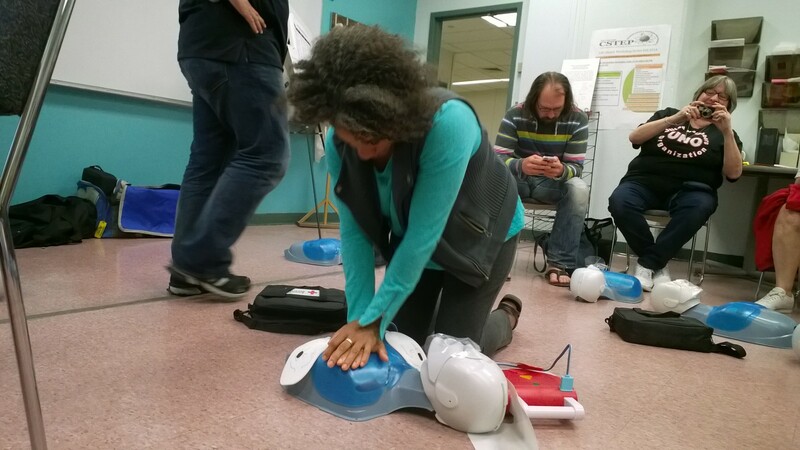 HarborLAB volunteer and professional adult educator Kamala Redd practices CPR. Selected HarborLAB volunteers received Red Cross adult and pediatric certification on Sunday for CPR, AED, First Aid, and Basic Water Rescue. Other HarborLAB volunteers, especially our medical professionals, teachers, and first responders, already have certification. Our first responsibility, even before providing experiential education in the STEM (Science, Technology, Engineering, Math) subjects, is to keep the students and public program participants we serve safe. We are deeply grateful to the following for this indispensable safety training: CUNY LaGuardia Community College Aquatics, LaGuardia Community College Natural Sciences, hosts for our training, and the Newtown Creek Superfund community outreach program of ExxonMobil, sponsor of of our training. We’re also grateful for the continual encouragement of the NYC Department of Environmental Protection and Catskill Watershed Corporation in pursuit of this goal, and to Newtown Creek Alliance Historian Mitch Waxman for his guidance. We also thank the Newtown Creek Group and Connective Strategies for fostering a positive partnership as our community’s residents and employers share the long and arduous undertaking of restoring our waterway to a living and clean ecosystem. Many volunteers expressed interest but of those available Sunday we chose people with a proven record of service to HarborLAB and access to the Newtown Creek, East River, and Neversink Reservoir. We also chose people with differing schedules and program interests, rather than those who typically clustered. Our goal was to achieve a spread that will ensure we have at least one person at every program with this full suite of certifications. We’ll have additional canoe and kayak training when the weather warms. While this training is vital for the protection of students and the public, our approach to certification holders is non-hierarchical. Volunteers with other skills, including those purely on land, are essential to our mission to promote inclusive service-learning for the environment. Also, we welcome other volunteers to create and and lead programs knowing that one of these 12 certified volunteers will participate to add another layer of safety. Those newly certified are Sally Attia, Erik Baard, Bob Din, Roy Harp, Laura Risi Hoffman, EJ Lee, Jeff Lim, Gil Lopez, Dorothy Morehead, Mairo Notton, Kamala Redd, and Ray Tan. Reflecting our commitment to Newtown Creek as well, volunteers Laura Hofmann and Dorothy Morehead serve on the board of the Newtown Creek Alliance. Dorothy is also chair of the Environmental Committee of Queens Community Board 2. The merry HarborLAB crew after practice rescues and water skills. We had a great time during this long, demanding day. The LaGuardia Community College Aquatics staff was kind and incredibly helpful. As a result of our training, we’ll be practicing paddle reach rescues, and purchasing more throw lines with floats. Instructor Mr. Rana had an exceedingly civil and gentle demeanor that conveyed a sincere care for others. Aquatics Coordinator Dragos Coca was warm and extremely capable. FrontLine Health delivered a friendly but thoroughly professional presentation and training that exceeded basic lifesaving skills to help us understand what we could do as an organization to deploy safety resources most effectively within legal and policy frameworks. We also learned from instructor Shane Woodall in frank and sobering terms the stark limits to CPR and First Aid, and the primacy of AED therapy in saving lives. Our group set out an action plan to map out AED availability in areas where we have public paddles and to budget for the purchase of our own waterproof AED. Minutes are critical when a heart ceases to function and paddlers are often isolated. For each minute of CPR, a victim’s chances for survival drop 10%. With no care, the victim is lost in four minutes, but even with care, the goal of CPR is merely to buy time until an AED can be deployed and help summoned by 911 can arrive. 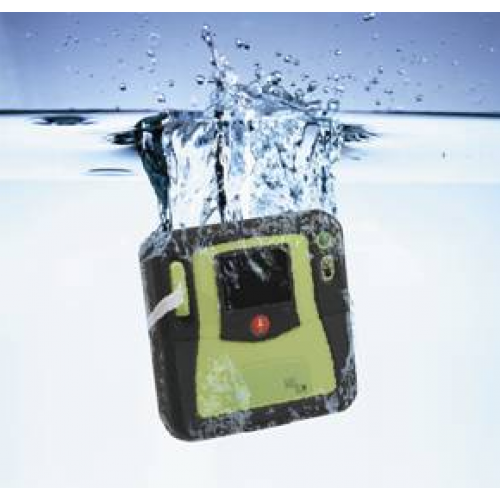 Waterproof AED. A new budget priority for HarborLAB. HarborLAB Operations Manager EJ Lee is no dummy. Or so we thought…. 😉 She’s wearing her shirt from serving as a kayak safety to the cancer-fighting fundraiser Swim Across America. Several HarborLAB volunteers and boats are dedicated to that annual event. HarborLAB crew gathers in the morning, outside the LaGuardia Community College pool. Erik Baard and Sally Attia with the very patient and kind Mr. Rana, our water rescue instructor. A thoughtful Roy harp and an impish Sally Attia with Ray Tan looking like he’s about to zing photographer Jeff Lim with a one-liner. EJ Lee demonstrating on way of rafting on a life ring. Some silliness. Sally Attia admires Ray Tan’s belly flop redness. The HarborLAB crew after training. Shane Woodall of FrontLine Health delivers the First Aid, AED, and CPR training. Gil Lopez created a new Newtown Creek Alliance mascot. 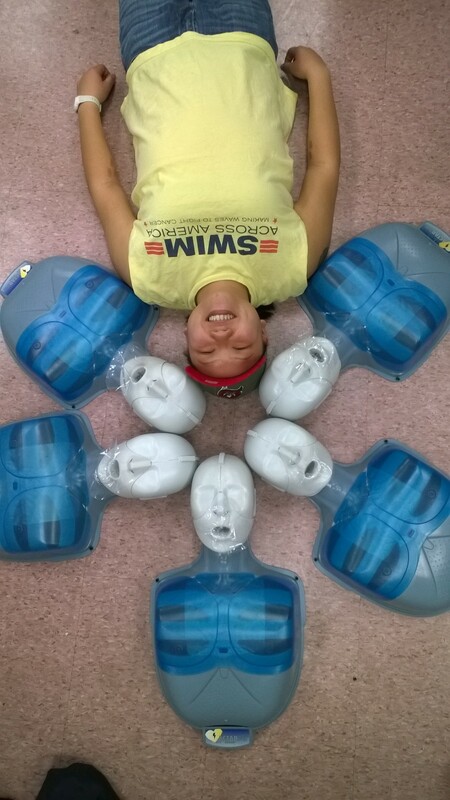 Kamala Redd hooks up the AED. Roy Harp saw the artistic possibilities and EJ Lee ran with it. Sally Attia demonstrates the “stay clear” motion because any contact with a patient will confuse the AED machine during heart analysis. EJ Lee stops Erik Baard’s vascular bleeding. Newtown Creek Alliance Board Member Laura Hofmann makes a new friend. She made many on Sunday!